Jewish Home leader reportedly pressuring Netanyahu not to bring 'mediation document' to ministers' vote. A mediation document that US Secretary of State John Kerry intends to hand over to Israel and the Palestinian Authority is causing consternation and tension in the Israeli Cabinet. Kerry is reportedly crafting a document with a proposal for a framework agreement, in the hope that it would eventually lead to a peace deal between Israel and the Palestinian Authority. 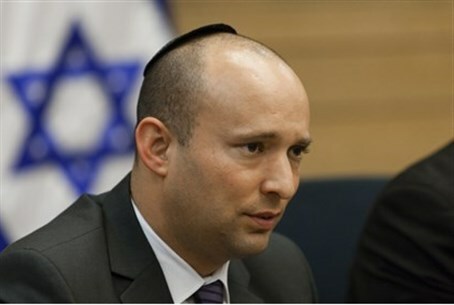 According to senior Likud politicians, the Jewish Home party's chairman, Economics Minister Naftali Bennett, is placing heavy pressure on Prime Minister Binyamin Netanyahu not to bring the document to a ministerial vote, when he receives it from Kerry. The Likud sources say that Bennett is concerned that if the matter is brought to a vote, he may have to leave the government. Until now, he has been able to avoid making a decision on leaving the government because talks have not yielded anything substantial. However, a vote on a document detailing Israeli concessions that he strenuously opposes could make it impossible for him to continue postponing a decision. Even if Kerry's document contains a relatively “soft” version of the American demands from Israel, Bennett will have a hard time avoiding a confrontation with the prime minister. Netanyahu himself has been asked, in a meeting of Likud ministers, whether he intends to bring the document to a ministerial vote, and replied that he has yet to make a decision on the matter.